Like good old Augustus Gloop, we at MyChocolate can’t get enough of the sweet, dark stuff. We are guessing you are people after our own heart, since you’re reading this blog. So to further whet your appetite, we’re going to take you on a magical mystery tour of chocolate corporate event ideas. We’re not ones to boast (promise! ), but we’re pretty good at this. Well, it has been 8 years non-stop hosting this most popular of workshops. Cut, dip and decorate your own handmade treasures, pop them into ribbon tied boxes, then toast your newly found choc prowess with your clients. Everyone’s happy – that is unless you arrive home with an empty box. Picture the scene: you arrive at the venue, you’re booted, suit ed and fluted…it’s time to mingle. Now whilst the lucky few glide around delivering effortless quips, some of us (ahem) may feel a wee bit shy in such situations. And this is the beauty of the chocolate fountain. Awe-inspiring and endlessly delicious, the fountain is the leveller of all men. It’s an easy talking point…unless you have a mouth full of chocolate-covered profiterole, that is. We are certainly partial to a glass or two of red, but coupled with a complimentary truffle and you’ll be in a very chocolatey seventh heaven. We consulted our lovely sommelier who helped us find the most delicious combinations. One of our many favourites? Deep tawny port with a rich cinnamon milk truffle. This event is popular with the menfolk too. 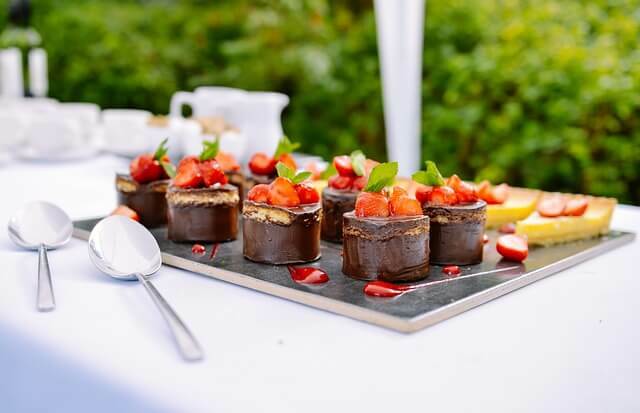 Chocolate corporate event ideas will get your taste buds tingling and bring smiles to many faces. Contactthe MyChocolate office to discuss a bespoke corporate event for your clients. Here's a case study about a recent corporate event we held. Check out MyChocolate's truffle recipe in the new Green & Black's book.